I don’t make cakes for a living, but when one of my best friends, who I’ve known for 13 years, asked me to make her wedding cupcakes I didn’t hesitate to agree! 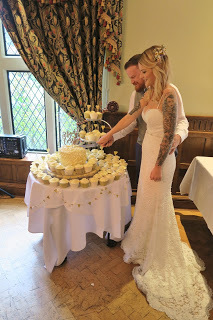 Her wedding was Harry Potter themed so Butterbeer Wedding Cupcakes were requested. If you have seen the Harry Potter films you will know of the drink butterbeer enjoyed by the characters when visiting pubs and taverns. 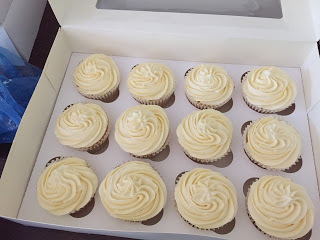 I wanted to share with you how I got on making 100 cupcakes, plus a large cake, and also the recipe for the Butterbeer Wedding Cupcakes if you would like to make them yourself! So I’ll start with the flavour. Butterbeer, is described as “a bit like less-sickly butterscotch” and does have an mild alcoholic content in the Harry Potter stories. However, the butterbeer served at Harry Potter World in Florida contains no alcohol (presumably so adults and children alike can enjoy the beverage!). 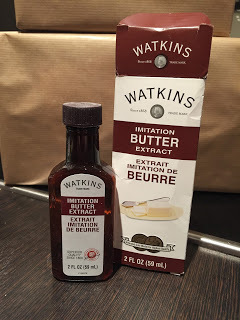 In order to flavour the icing, the bride-to-be obtained a few bottle of the above pictured butter extract from America. You can get it online from Amazon, and there are other brands that make it too. 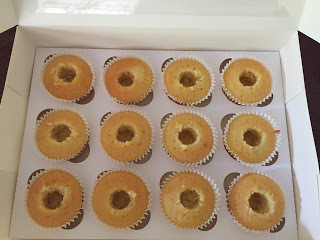 I also suggested filling the cupcakes with caramel, as butterscotch is essentially a caramel flavour, and to make them extra special. It was very important to trial the cupcakes for the happy couple, so I made a small batch of about 6 cupcakes for them to taste. Suffice to say they were happy with the flavour! They have both visited Harry Potter World and tasted butterbeer itself so they were able to confirm the flavour matched. They were also huge fans of the caramel inside. 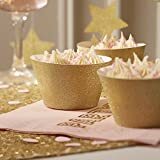 For the decoration, a simple swirl of buttercream was requested, along with a sprinkling of gold glitter. The large cake would be filled with strawberry jam and covered in the butterbeer buttercream with a ‘spiky’ effect all over. The process of making the sponge was quite straightforward. 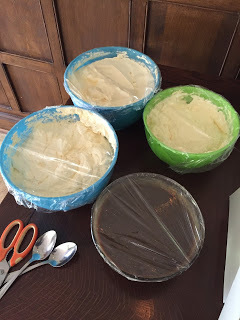 I started with the large cake, making the two layers on separate evenings, wrapping them up in cling film once fully cooled and freezing them. I then spent the week before the wedding making a batch of 24 cupcakes every evening until I had enough. I also wrapped up and froze these too. Although 100 were requested, I ended up making around 110. It’s always good to have a few extra! Two days before the wedding I made the caramel filling and buttercream. I slightly overestimated to make sure I had enough. I used 3kg of butter and 6kg of icing sugar for the buttercream! 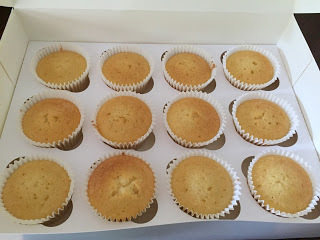 I used an electric hand mixer and a flour sifter (to sift the icing sugar) to make the process as easy and fast as possible. As usually I just mix buttercream by hand if it’s a small batch. 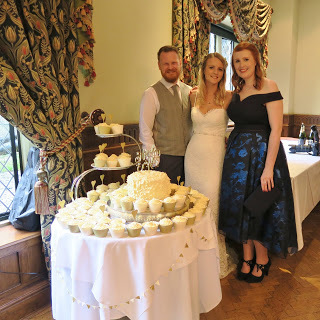 All the cupcakes and the large cake were also taken out of the freezer by this point and I stored them in cupcake boxes for ease of transport, and also so I wouldn’t have to worry about collecting my own tupperware from the wedding venue. 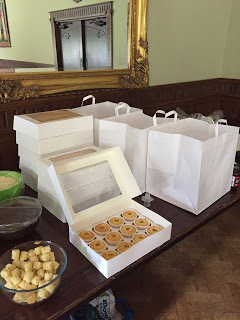 They could just dispose of the boxes, or they could be used by guests for taking cake home. The day before the wedding I decorated and filled the cupcakes at the venue. 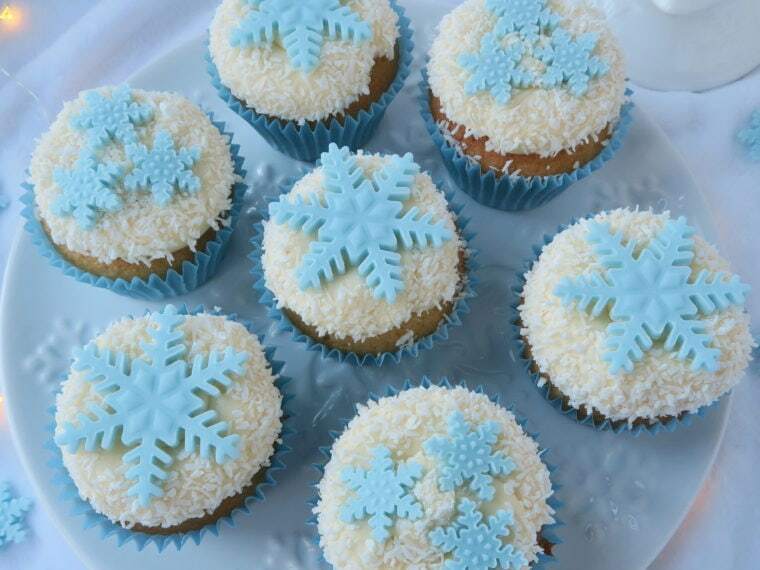 I started by coring them all using a cupcake corer. Again this made the process easier, and also the holes are much neater than using a knife. I used a piping bag to fill each hole with the caramel. 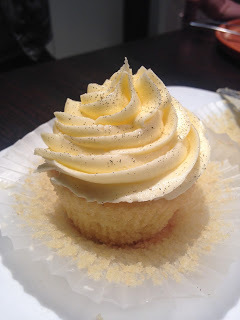 Then I piped the buttercream onto each cupcake and sprinkled half of them with glitter. 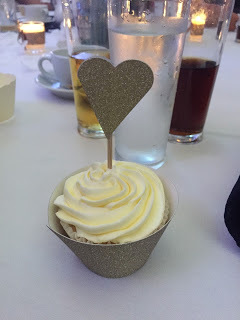 The bride decided that half would have glitter sprinkled on top, and they would be place in cream cupcake wraps. 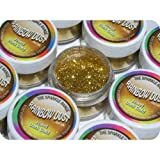 Then the other half would have no glitter, and be placed in glittery cupcake wraps. I also covered the cake at this time. I gave it one base coat of buttercream, then placed it in the fridge, which the venue kindly let me use. 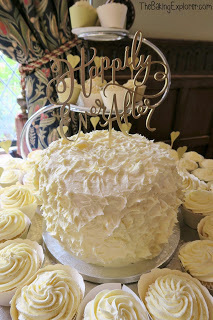 On the morning of the wedding I finished the large cake with a second layer of buttercream and a ‘spiky’ effect which I used the back of a spoon to create. I also (with help from some friends) put each cupcake into a wrapper and arranged them on the display table, with the large cake in the middle. If you like the cupcake wrappers and heart shaped toppers you can get them from Ginger Ray. If you like the large cake topper it was from a company called Better Off Wed. This is me with the happy couple! I was so pleased with the whole cake display and how it all looked. They loved it too, which was the biggest thing for me as all I wanted was for them to like it. It is a lot of pressure to make something like this for such an important day in a couple’s life so I really wanted it to be everything they had imagined. After the cake was cut I had to emotionally ‘let go’. If you are a baker like me, you will understand what I mean by this! Basically when I make something and I put so much time, effort and love into it, seeing it go to waste or not get eaten can be difficult for me. 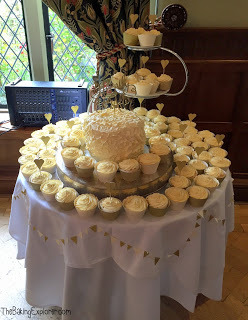 So at this point of the day I just said to myself that I’d achieved what I wanted, and if some didn’t get eaten or had to be thrown away it was ok.
Thankfully, I saw a constant stream of wedding guests eating the Butterbeer Wedding Cupcakes all evening long! I saw couples having fun with them by pushing the buttercream into each others faces, and people nodding in satisfaction as they tucked in. It was a great feeling! 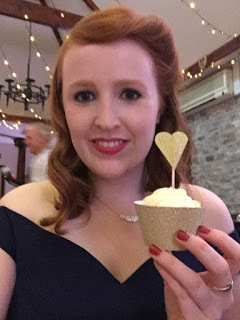 I tucked in to one of the Butterbeer Wedding Cupcakes and really enjoyed the flavour. The caramel is to die for! So that’s my story and I hope that you enjoyed reading it, and if you are asked to do anything like this for a friend, or as a business opportunity, I hope it’s given you some helpful tips. 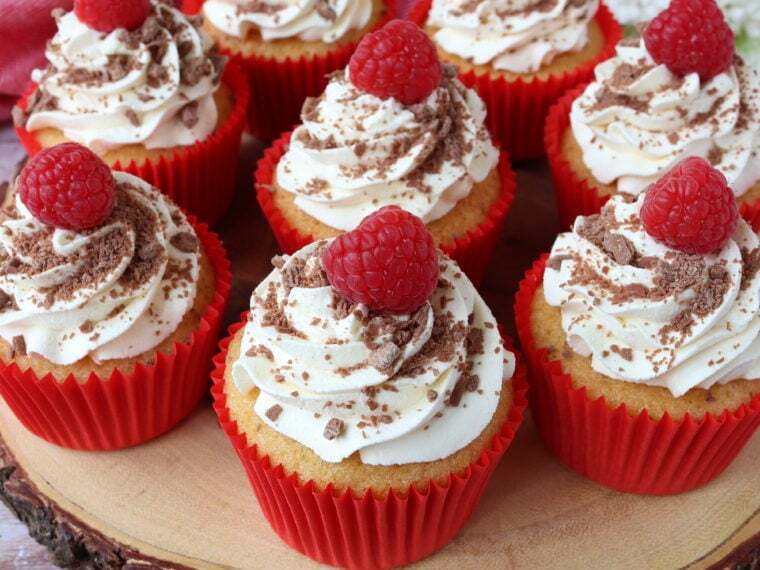 If you just came for the Butterbeer Wedding Cupcakes recipe, then find it below! 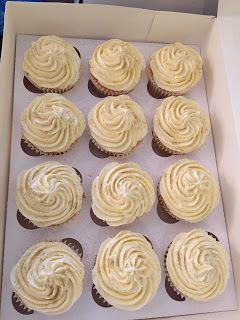 I’ve provided quantities for 24 Butterbeer Wedding Cupcakes. 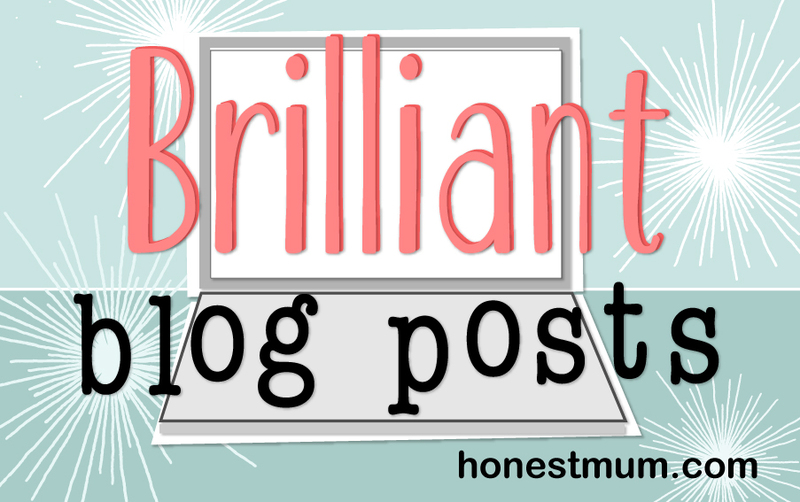 I’m linking up with Brilliant Blog Posts hosted by Honest Mum. I'm glad to hear I'm not the only one getting emotional about baking! I can't take full credit for the flavour as the bride is Harry Potter obsessed! These are really beautiful Kat. What a lovely contribution to a special day. I am not surprised the happy couple were pleased! I definitely understand the struggle to 'let go' though….. I feel that whenever I make anything and share it, even with my family! 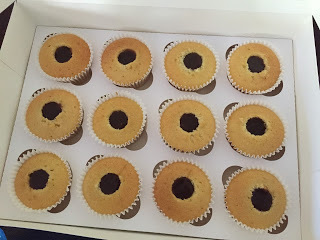 I am a big fan of cored and filled cupcakes….. I usually 'cap' mine after filling…. maybe I won't bother next time….. reading this, it seems an unnecessary bit of the process!?! Yes I never 'cap' them after filling them, unless I was doing butterfly style cupcakes, so I would agree it's not necessary. Plus then you get some baker's snacks to munch on!